Time to get started, people. Anaheim type - NuMex "Joe E. Parker"
the small one hold 4 seed starter kits and is the current home of the 2 x snap peas and two trays of tomato seed starters. I have been using a string of xmas lights in each GH to provide heat overnight. Had minimal cold damage when it went below zero for a few nights but the system held up just fine 'cept for a couple of nights. 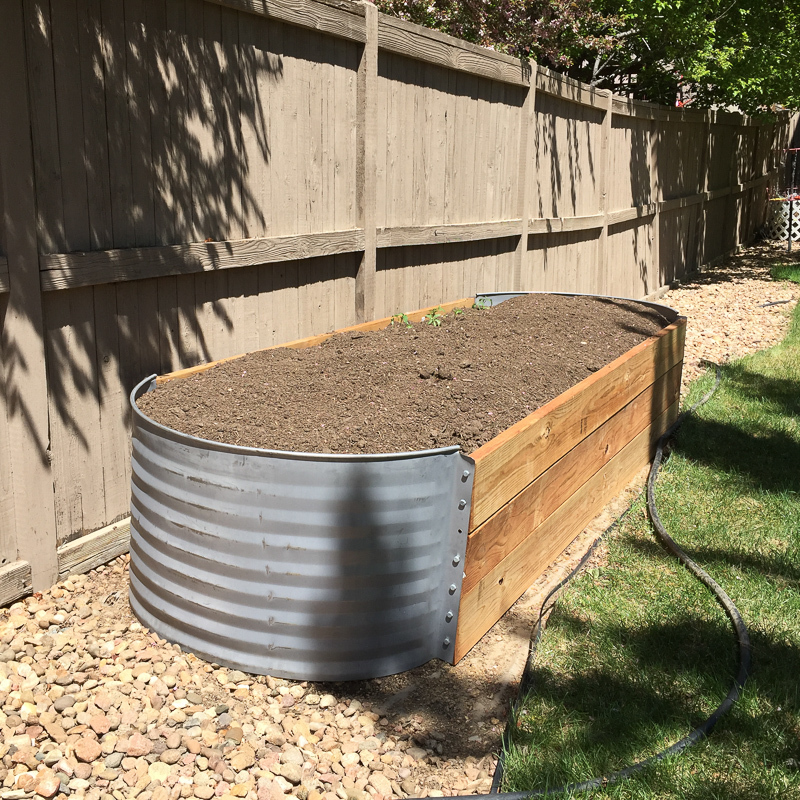 Our dirt here is pretty bad so I'm building a raised bed this spring. Just started eggplants and peppers last week (several different kinds of peppers), including padron, which I've never seen in the flesh anywhere but Spain. Hoping I can grow them here, and that my big stupid adorable lunk of a cat, Boris, doesn't dump over the shelf with all my pots on it like he did last year! Tomorrow, weather permitting, I will plant the peas, radishes, and arugula and other greens (kale, mustard, a couple packets of spicy Italian greens mix and that kind of thing)outside. Tomatoes will get started inside in a couple of weeks. Not sure about the Cipollini onions - I tried transplanting them last year, but it didn't work very well and I'm considering just direct seeding them this year. I just started my chiles and tomatoes today, as I started a bit too early last year, and the starts were a little unwieldy to transplant. Same method: compressed peat discs and a covered greenhouse tray, perched on a wooden radiator cover in a second-floor south-facing window. . .
Just checked the mini-greenhouse. Seven "Brandywine" tomatoes have sprouted already, and are about two inches tall. Whoa. Wow! Where did you get your seeds? A couple of my peppers and eggplants from 2 weeks ago are up, but nowhere near that big. And the stuff I planted outside last weekend isn't poking out yet, probably because it's been so cold. 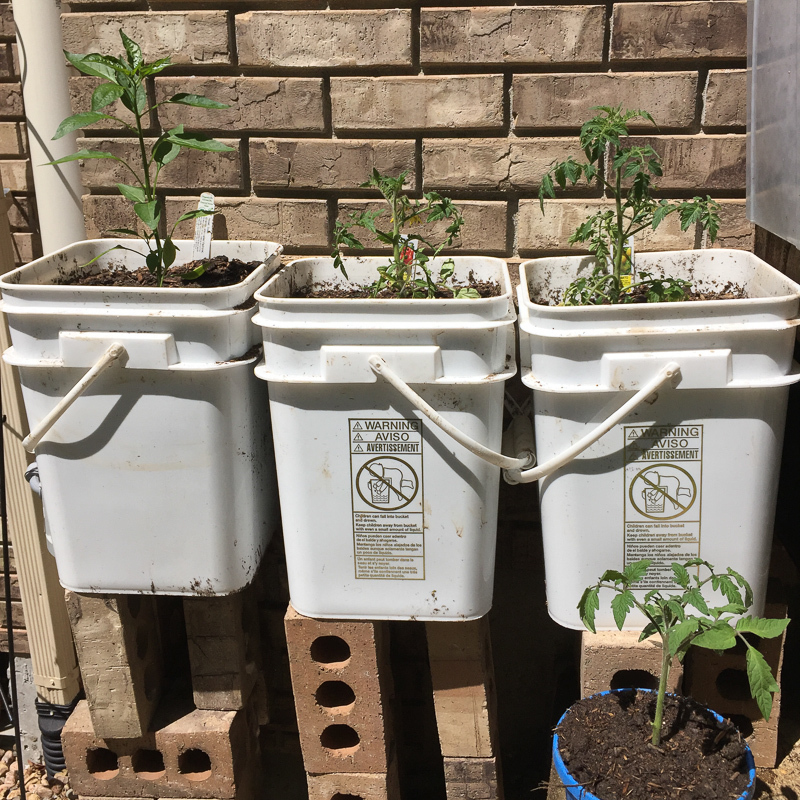 The down side of a community garden plot is before they turn the water on, the only way to water is to haul buckets from our condo - although luckily we're on the first floor and the garden is just next door. To be planted:Slo bolt cilantro (we'll see about that), Speckled lettuce, Sunflowers (Baker Seeds threw them in as free gift). Wow! Where did you get your seeds? I buy my seeds at Chalet Garden Center in Wilmette. Great selection of top-quality garden seed purveyors; this year, I went with Botanical Interests for the Brandywines, as well as the serrano and Anaheim New Mexico varietal chiles. Last year, I used Seed Savers Exchange seeds, also from Chalet. Really highly recommended for anything you could possibly need for your garden; the fall bulb selection is jaw-dropping, as is the selection of herbs and flowering perennials. Highly recommended! In a fit of optimistic insanity, Chouxfly and I started almost a thousand seeds in the unused greenhouse above DePaul's biology department, in hopes of growing enough starts to sell as a fundraiser for my little community garden. I seem to be utterly unable to post a photo to LTH, but eight big trays under two banks of grow lights full of sprouts (most cells have 4-6 seeds) is so exciting! One thing I'm particularly excited about growing this year is a bunch of dwarf tomatoes from seed that was given to me by Craig LeHoullier (who actually wrote the book on tomatoes), as part of a project he is working on. I will have about six of each of four varieties, as well as hundreds of other tomato plants (cherry, brandywine, roma, early, plus seeds from a mystery tomato I liked last year that I suspect is Cherokee Purple). We also started a few varieties of peppers, some eggplants, and lots of flowers (mostly marigolds and zinnias). I'll start some other faster crops in the next few weeks, after we pot up these guys. It's been amazing to watch how quickly they grow with the lights in an ideal environment; now I want my own greenhouse! Mamagotcha, I need to follow up with you on this greenhouse business! I work at DePaul and I've always wondered about that greenhouse! Novice gardener here... Anyone manage to keep a dwarf lemon tree alive in their homes? I'm considering purchasing one as a gift. Any sources for purchasing would also be greatly appreciated. So the seed company, in its infinite wisdom, decided to send me the ten bare root strawberry plants NOW. It's snowing. What can I do with them until it's safe to plant them outside? Can I just stick the package in the fridge? Should I plant them in pots and put them in the window with the other seeds I planted yesterday? Something else? rtb178, sorry for the tardy reply. I've had a good deal of luck with indoor citrus for the past few years; I currently have one Kaffir lime, and three Mexican limes that I grew from seed - and the seeds came from fruit borne by a Mexican lime purchased at Treasure Island, of all unlikely places. At this time of year, I'd check at independent garden centers, such at Chalet up in Wilmette, or Gethsemane in Andersonville. Later in the season, the aforementioned TI carries a variety of citrus. Just call around. I got my Kaffir from Leela Punyaratabandhu, of "She Simmers" fame - it came from the grower in the mail as little more than a twig in a box of wood shavings, and it is now nearly a yard tall and just as wide. Great houseplant. Citrus is pretty easy to grow indoors, as long as they have a sunny place. My Kaffir has thrived on an unheated second-floor landing with a big uncurtained east-facing window; just dial down the water in the winter, and feed occasionally with a dilute solution of Miracid (the stuff used on Azaleas and other acid-loving plants). The really fun thing about citrus is the random growth spurts. My Mexican limes (same light conditions, but in my living room) have grown about two inches since March 1, and the Kaffir has thrown out multiple new 6" branches since April 1 (! ), and is about to flower. Citrus are evergreen, and seldom drop leaves unless stressed; trimming the Kaffir leaves for cooking seems to keep mine in good shape. Debating putting the tomatoes and peppers and eggplants into the raised bed today, but the weather has been so crazy, I'm hesitating. The greens are going gangbusters, as are the peas. I hope we can keep up with them! The strawberries don't look like they made it. The French Breakfast radishes look like they will be ready to harvest in a few days, but the others look like they are taking longer. I'm contemplating some kind of additional trellises for the cucumbers and melons. Anyone have any tips? My MIL have us the All New Square Foot Gardening book for Christmas, and it has lots of ideas in it. Finally got around to prepping the veg garden yesterday (16x8'). 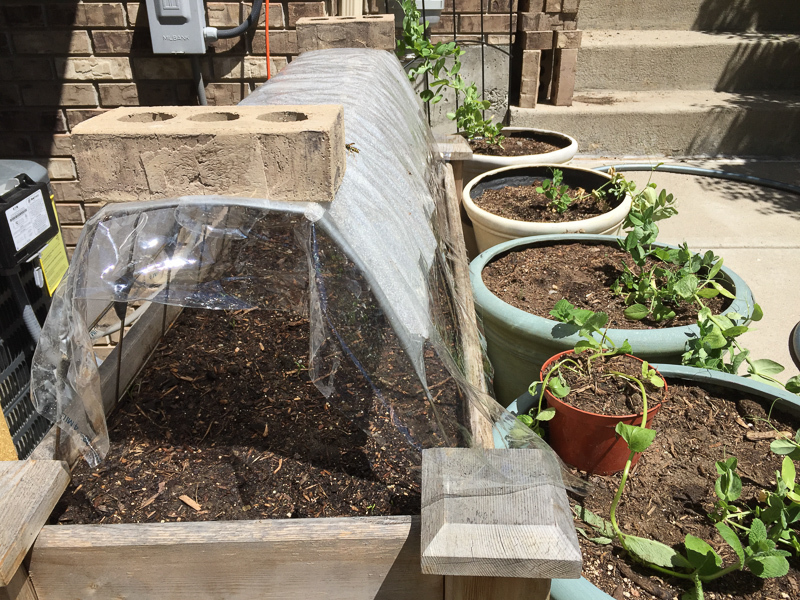 Added more topsoil, turned everything, covered 2/3 in black plastic for the tomatoes and peppers, then planted a row each of snap peas, mesclun, gailan and collards (trying that instead of dinosaur kale this year). I did decide to live dangerously and pop in the morning glories and Four-o-Clocks yesterday, as the wildly exuberant MG vines were starting to attack the chile seedlings. Just checked, and none seem to have suffered transplant shock, so I hope that this week's very cool night temps don't do them in! 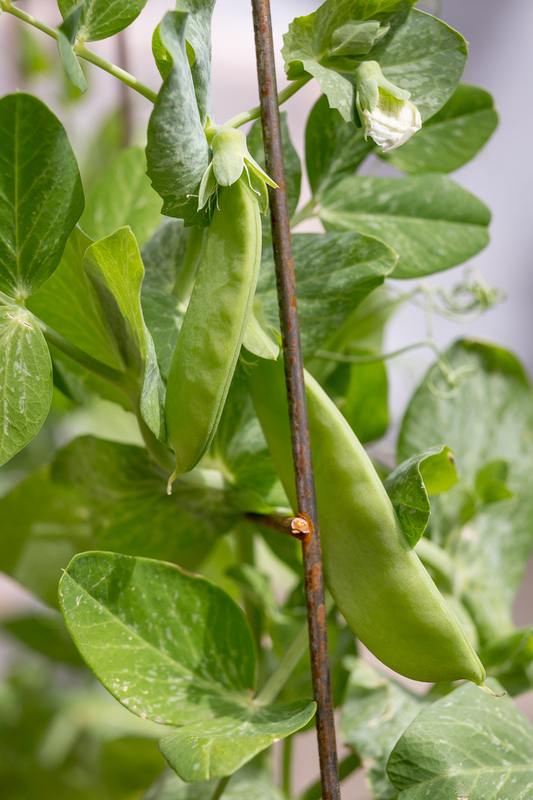 Some of the Peas I've got growing on the south wall of my house in CO.
why let the snow go to waste! My newly built 10.5 x 3.5 x 24" high container bed. an apple mint for my 12 YO's mocktails. I was going to plant all my tomatoes and remaining peppers and cucumbers and melons outside, but it's kind of cold. Should I wait some more? I am torn between thinking it's too damn cold and thinking that the poor babies just need more sun than I can give them inside. 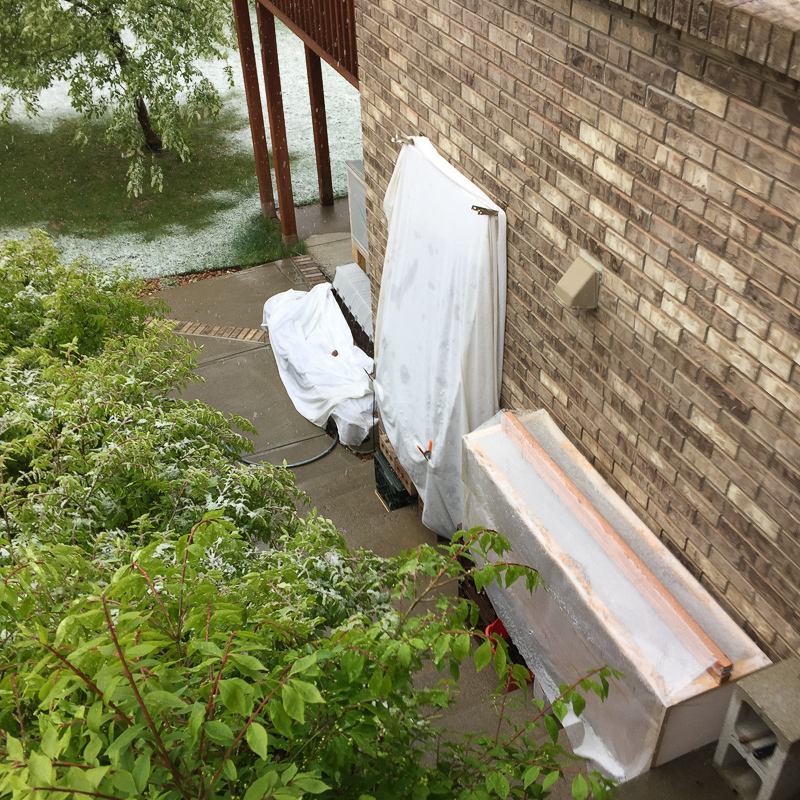 Ideally, you need to harden them off--if they've been indoors the whole time, they're going to have a really tough adjustment if you go straight from indoors to in ground in our climate. I just checked the 15-day forecast and we only have 2 days over 70 in the lot and those aren't til next week. 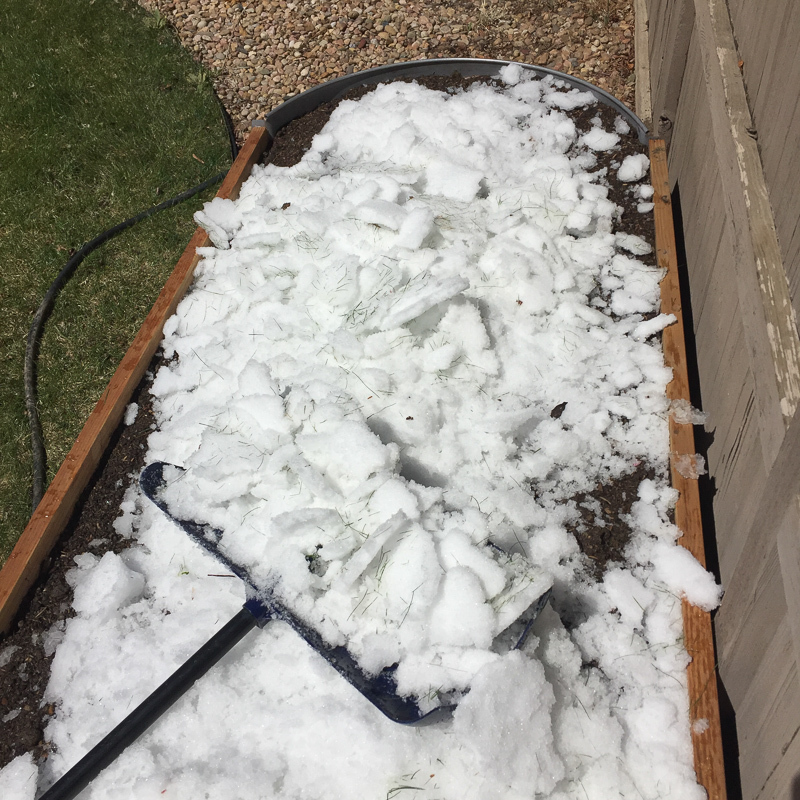 This spring has really sucked. I haven't been terribly consistent about taking them outside - my memory isn't the best when I'm leaving for work at 7:30 am! But I don't think I'm going to plant them yet; the few I planted last week didn't make it. Maybe I will just repot them in bigger pots and wait another week or two. Just surveyed both gardens after the rainstorm(s) - no damage, and tons of unexpected sprouts. I just planted the Thai basil, substitute 4-o-clocks & morning glories, and Tithonia last Sunday, and everything is up already. Sweet! One tomato didn't survive the heat last week, but I have a spare in the dining room. 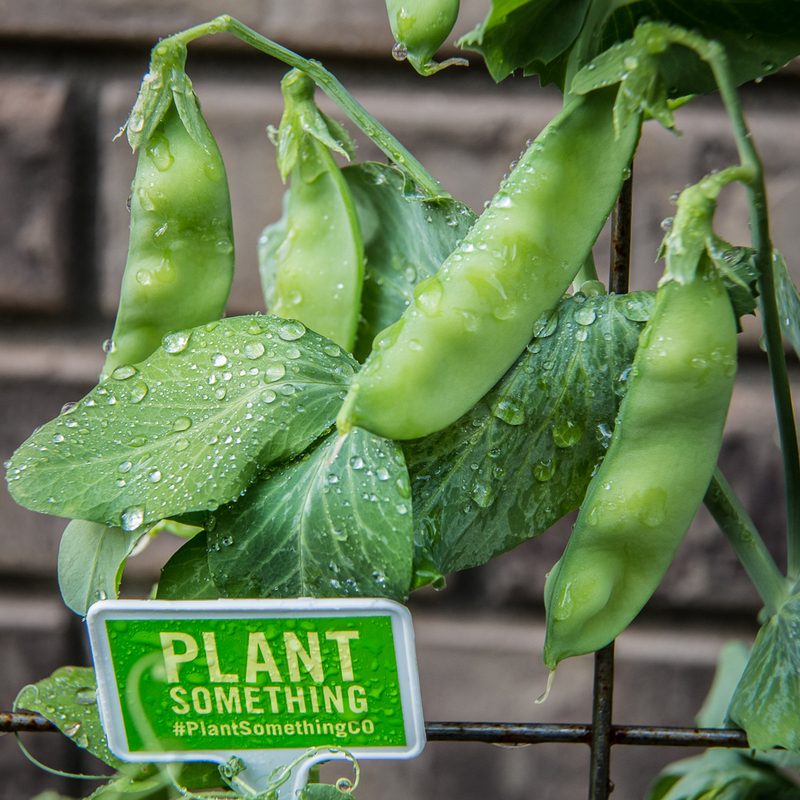 Growing from seed will save you a lot of aggravation, as well as a ton of cash. Most surprising (apart from the about-to-bloom peony in the tomato bed) is the the unexpected find in one of my living room window boxes. I replaced three of the thymes that winter-killed with one new silver thyme and two oreganos way back in late April. The French thyme that over-wintered has taken off this week - and to my surprise, the Thai basil from one box self-seeded, and is sprouting like mad. Bonus! Plus Thai basil is a nice foil for the trailing oregano and thymes, and all of 'em are bee magnets. Pics this weekend! the peas are producing at the moment. Tomatoes are moving along slowly but the heat of late has been helpful! So far, the summer is off to a smashing start! Helps that I replaced some of my rattier containers with better ones and replaced a lot of the soil. But the weather has been pretty spectacular. Have had some lovely strawberries, plentiful greens, breakfast radishes and herbs, as well as a bumper crop of snap peas and the rest of the shell peas are almost ready. tomatoes, potatoes & corn oh MY! boudreaulicious wrote: Here are some pics! Well thank you sir! After our wet, chilly spring, had my doubts about what we were in for this year but shouldn't have worried. Looking forward to sharing the bounty in a month or so! What he said - really impressive! Would you consider voting for me?